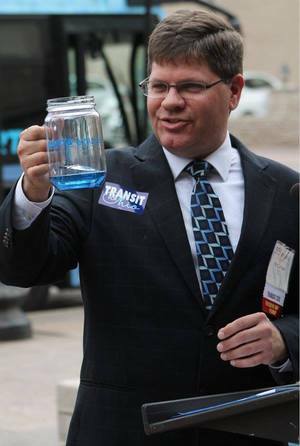 A Bus that emits only water? You better believe it! To understand how a fuel cell works first, we need to understand what a fuel cell actually is. A fuel cell is a device that uses hydrogen and oxygen to produce electricity and the only byproduct, or what is emitted, is water and heat. Based on that understanding, you can say that a fuel cell vehicle is very similar to an electric vehicle. Both systems use batteries for storage and an electric motor for operation; however, where a fuel cell differs is that instead of having to charge for hours on end the hydrogen fuel can produce electricity as long as there is hydrogen in the tank. Sounds kind of similar to a gasoline tank, right? That’s because it pretty much is! Even the fueling times are roughly the same, typically a 6-8 minute hydrogen stop will fill up a buses fuel tank. But, How Does it Work, Exactly? Although the process of a fuel cell is fairly technical the basic concept is actually pretty easy to understand. First though, let’s look at a fuel cell like a sandwich. In a fuel cell there are two sides, or two slices of bread to keep everything together. It all starts with the compressed hydrogen fuel that is pumped into one side of the fuel cell. At the same time, oxygen that is found in the air enters from another side. In the middle of the sandwich, or the middle of the fuel cell is where all the action takes place. 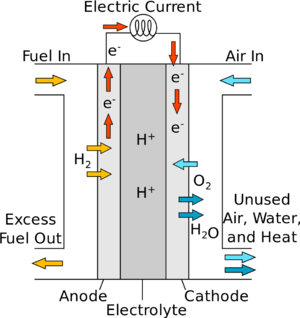 The hydrogen gas passes through a layer in which an electron (the source of electricity) breaks free from the hydrogen atom. This electron then passes through a circuit in which it powers an electric motor and returns to the other side of the fuel cell, where the oxygen is waiting. Here, a combination of hydrogen and oxygen produce water and heat as the only byproduct of the entire process. Did you know that compressed hydrogen used to power a fuel cell is actually safer when compared to gasoline used in the everyday vehicle? Since the hydrogen is in a gaseous state and fourteen times lighter than air, it is able to rise and dissipate in the atmosphere almost immediately. Hydrogen itself actually has a very good safety record throughout its fueling career. In fact, gaseous hydrogen is transported through 700 miles of pipeline across the United States and 70 million gallons of liquid hydrogen are shipped by truck over U.S. highways without incident. Just as with a gasoline-powered vehicle, the hydrogen is stored in tanks which are fueled up at “gas” stations, except gas in this case really does mean gaseous hydrogen! Not only are fuel cells considered safer than gasoline-powered vehicles, they are also 2x-3x more efficient! The fuel cell is able to use 40%-60% of the energy from the fuel, the hydrogen, to power the vehicle. To put that into perspective, a typical gasoline engine is less than 20% efficient at doing the same thing. This efficiency means that the fuel cell can reduce the need for about 9,000 gallons of fuel over the lifetime of the vehicle and that the carbon released into the atmosphere would decrease by 100 tons per vehicle. That’s the equivalent of 10 school buses of carbon emissions! A fuel cell also has no moving parts to the operation as it is only gas that flows through the system. No moving parts mean no noise and an almost whisper-like operation. It also means lower maintenance costs and less engine wear. Overall, the biggest environmental piece of information regarding a fuel cell is this… the only byproducts of the process are heat and water, drinkable water at that! Hydrogen-powered vehicles are the fuel-efficient future of sustainable public transportation. By making the switch to hydrogen fuel, we're doing our part to conserve natural resources, reduce reliance on foreign fuel sources, bring thousands of jobs to the Midwest, improve the health in our cities and create a greener, cleaner future for our citizens. A key initiative of the Renewable Hydrogen Fuel Cell Collaborative, the Midwest Hydrogen Center of Excellence is a regional ambassador for the advancement and adoption of hydrogen-powered, zero-emission vehicles (ZEV) in Midwestern public transit. To learn more about Fuel Cells and the use of Hydrogen, click here. What's going on at SARTA? Take a look at our news stories to see what we have been up to.